The Avengers fight on Wakanda in Avengers: Infinity War. It’s June 7, 2017, the 59th day of shooting Avengers: Infinity War at Atlanta’s Pinewood Studios, and Wakanda is getting crowded. We’re on the set, watching Captain America (Chris Evans), Black Widow (Scarlett Johansson), Rhodie (Don Cheadle), Bruce Banner (Mark Ruffalo), Falcon (Anthony Mackie), Scarlet Witch (Elizabeth Olsen), and Vision (Paul Bettany) land a Quinjet in the secretive African country, seeking the help of the Black Panther. As they exit, King T’Challa (Chadwick Boseman), flanked by members of the Dora Milaje (including Okoye, played by Danai Gurira) walk up the platform to greet the heroes. Members of the Wakandan army walk onto the Quinjet to help a wounded Vision and Scarlet Witch off, because the Avengers have arrived in Wakanda to get help for the android and to bring a warning: Something big and purple is coming, and his name is Thanos (Josh Brolin). 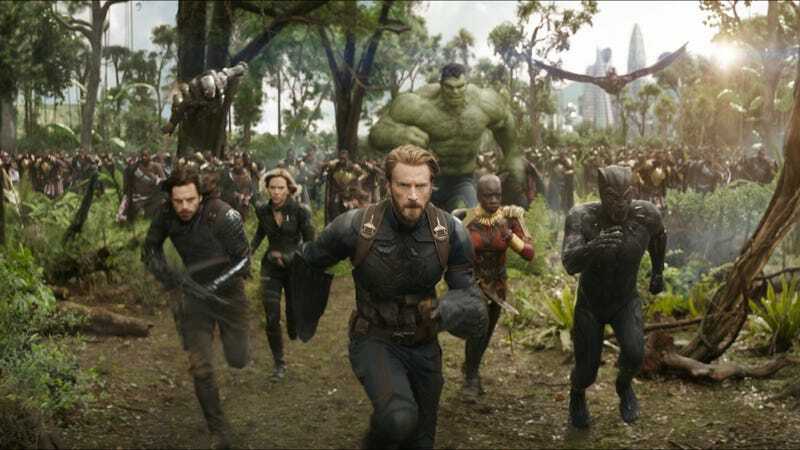 Although set in Wakanda, the scene was shot on a studio backlot in Atlanta, which is the same exact place the Avengers last assembled, to shoot the massive airport battle in Captain America: Civil War. In fact, this time, much of the cast is the same, the directors (the Russo Brothers) are the same, even the writers (Christopher Markus and Stephen McFeely) are the same. And yet, everything just has a much larger scope, because it’s Infinity War. The set for this one scene alone includes half a Quinjet, a massive platform with about 20-foot-high fencing on one side, and about 180 degrees of green screen that stands in for Wakanda. “How big an assault?” T’Challa asks after the initial greeting. “Quite an assault, sir,” Cap replies. “Well, I have my King’s Guard. The Dora Milaje—” T’Challa says, but is interrupted off-screen. “And a semi-stable 100-year-old man,” adds Bucky. Bucky (Sebastian Stan) and Steve Rogers reunite with a hug. “How you doing, Buck?” Cap asks. “Not little. Not green,” says Widow. Falcon expresses some doubts about Bucky’s mental state. “I just want to make sure you aren’t going to snap when someone says ‘baloney sandwich,’” he jokes. Falcon takes flight over Wakanda. Though this is day 59 of Infinity War’s seven-month shoot, this is the first day this many Marvel characters are on screen together in this movie, according to Mark Ruffalo, who sat down with reporters along with Chadwick Boseman last June. Boseman—who went directly from filming Black Panther, also in Atlanta, to filming Infinity War—explained how this scene happening in Wakanda makes sense for both the movie and the production. “There goes the neighborhood,” Ruffalo quipped. Bruce Banner definitely has some concerns. According to Ruffalo, Bruce Banner returns to Earth with way more knowledge about Thanos than any of the other characters, likely a result to whatever happens to him in the Asgardian spaceship following the events of Thor: Ragnarok. Facing that danger isn’t just Black Panther, Captain America, Black Widow, Rhodie, Bruce Banner, Falcon, Scarlett Witch, and Vision, though. There’s also Iron Man (Robert Downey Jr.), Thor (Chris Hemsworth), Spider-Man (Tom Holland), Doctor Strange (Benedict Cumberbatch), Ant-Man (Paul Rudd), Hawkeye (Jeremy Renner), the Guardians of the Galaxy, and maybe even Nick Fury (Samuel L. Jackson) and Captain Marvel (Brie Larson, who had a mailbox on the Infinity War set despite no announcement her character would be in the movie, but more on that soon). All of those characters will be needed to defeat the Thanos, making Infinity War a beyond-massive undertaking. But this is just scratching the surface of the film. We’ll have much more from the set of Avengers: Infinity War in the coming days, including interviews with directors the Russo Brothers, writers Christopher Markus and Stephen McFeely, and actors Chris Evans, Scarlett Johansson, Danai Gurira, Don Cheadle, Elizabeth Olsen, and others. Avengers: Infinity War open April 27.